Detention Of Al-Jazeera Journalists Strains Free Speech In Egypt : The Two-Way Canadian-Egyptian journalist Mohamed Fadel Fahmy has been accused of running a terrorist cell with the help of four foreigners; allegations the news agency calls "baseless and false." The case has shown just how far Egypt has backslid on the goals of an uprising that began three years ago this week. 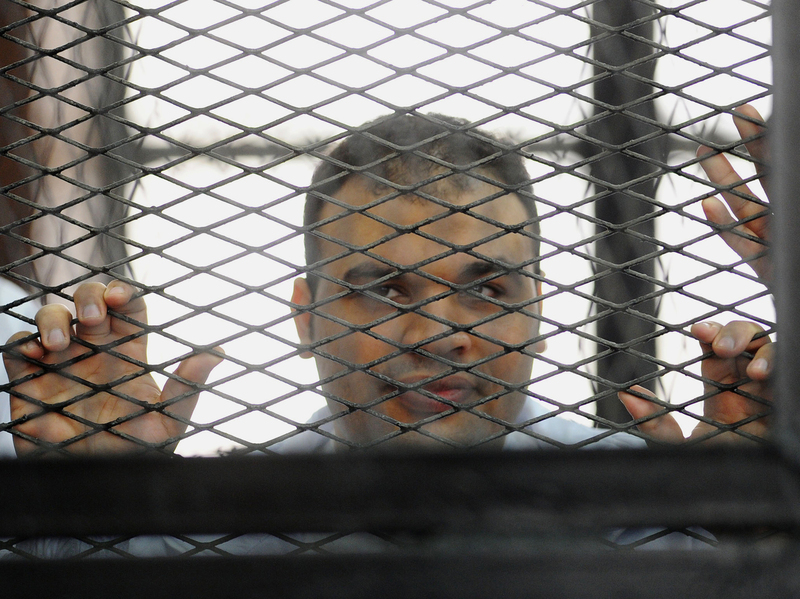 Mohammed Badr, a cameraman for Al-Jazeera, appears at a court in Cairo, on Dec. 4, 2013. He is among the journalists referred to the Egyptian criminal court Wednesday. Twenty people were referred to criminal court in Egypt today, among them three Al-Jazeera English journalists who have been in prison since Dec. 29. The charges are chilling. Egyptian authorities say Canadian-Egyptian journalist Mohamed Fadel Fahmy was running a terrorist cell out of a swank hotel in the upscale district of Zamalek. He was aided by four foreigners, according to the charges. "The world knows these allegations against our journalists are absurd, baseless and false," according to a statement from an Al-Jazeera spokesman. "This is a challenge to free speech, to the right of journalists to report on all aspects of events, and to the right of people to know what is going on." Fahmy is an award-winning journalist, formerly of CNN. According to his friends and family, he is far from an Islamist who belongs to a terrorist cell or a member of the Muslim Brotherhood, which Egypt's military-backed government considers a crime. The now-banned Muslim Brotherhood backed former Islamist President Mohamed Morsi, who was elected in Egypt's first free and fair election and then ousted by the military after mass protests against him. The confiscated equipment that prosecution officials say is evidence seems like the ordinary tools of journalists: video and recording equipment, notes and archived footage. The journalists are also accused of trying to destroy Egypt's image abroad by reporting false news and of working in Egypt without a permit. Four foreigners are charged, but only one is currently in detention. They are accused of funding and collaborating with the Muslim Brotherhood. At this point the names of the accused have not been officially released. But we know that Peter Greste, a Peabody Award winner and an Australian correspondent for Al-Jazeera English, is among them. And so is Al-Jazeera's Egyptian cameraman Baher Mohamed. They were both detained on Dec. 29 with Fahmy. Two other Al-Jazeera journalists from its Arabic channels are also detained. The case has shown just how far Egypt has backslid on the goals of an uprising that began three years ago this week. Demands at the time included greater freedom of expression; this case has had a chilling effect on journalists based in Cairo. Of course, Al-Jazeera is a special case. The Egyptian government is angry with the wealthy Gulf nation of Qatar, which funds Al-Jazeera, for its support of the Muslim Brotherhood and accuses the channel of biased and sometimes untrue coverage. But for Fahmy's family, the news is a shock. This fun-loving guy who was preparing to wed his fiancée is now in prison and accused of something they say they know is absolutely untrue. Fahmy's treatment in prison has deteriorated. His family says the blanket he had was taken away and that he sleeps on the floor of his cell with insects. His watch was also confiscated, they say. He's in solitary confinement and never sees the sunlight. And he's not allowed to shower or change his clothes. He still hasn't received treatment for his injured shoulder, and his family says he's being held in a prison reserved for the most dangerous of criminals. A spokesman for the Egyptian foreign ministry said that the 20 people will receive a fair trial and if proved innocent, will be released. But for the families of the detained, this is little solace. The Committee to Protect Journalist says that violations against press freedoms in Egypt are the worst in decades. "This attempt to criminalize legitimate journalistic work is what distorts Egypt's image abroad. The government's lack of tolerance shows that it is unable to handle criticism," a statement from the organization said. The Committee to Protect Journalist called on Egypt to drop the charges and release all journalists in jail. Liberal Amr Hamzawy, once a heartthrob of the Egyptian press, is now charged with insulting the judiciary over a tweet. He is on a travel ban. Renowned academic Emad Shahin, a professor at the American University in Cairo, is also charged with espionage. In a statement he condemned the charges as baseless and politically motivated. He has a Ph.D. from Johns Hopkins University and was formerly a faculty member at Notre Dame. It is a frightening time in Egypt for journalists, human rights groups and critics. The lines are blurry, and pointing out injustice appears to be a crime now. U.S. State Department spokeswoman Jen Psaki said the government's "targeting of journalists and others on spurious claims are wrong and demonstrates an egregious disregard for the protection of basic rights and freedoms." She added that the United States is alarmed by the charges against journalists regardless of their affiliation. "The state here seems to see itself in an existential struggle that pits the forces of good, open, free society against the Islamist 'terrorists' still struggling to seize control. In that environment, 'normal' has shifted so far from the more widely accepted 'middle' that our work suddenly appeared to be threatening. "...Our arrest has served as a chilling warning to others of where the middle is here." He signed it from Tora prison, the second letter he'd written from his cell.